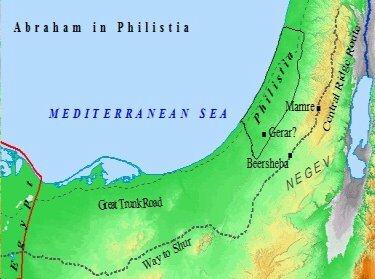 The maps below depict peoples and events throughout Old Testament history, from the varying theories on the Garden of Eden's location, to the exploits of King David. These maps are .bmp or .jpeg files of high quality. Downloading straight from the website produces lower quality and maps of much smaller, harder to read size. These are full sized, high quality maps perfect for study and teaching guides. The first place mentioned in the Bible is the Garden of Eden. 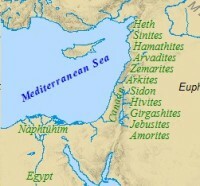 The tantalizing description in Genesis names two rivers familiar to us today - the Tigris and Euphrates. However, the others remain unknown. This partial geographical description has led to untold theories as to its location. One of these is the map below, the southern location in what is now Iraq, Kuwait and the Persian Gulf. The descendants of Canaan, son of Ham, were known as the Canaanites and occupied the Holy Land before Israel. 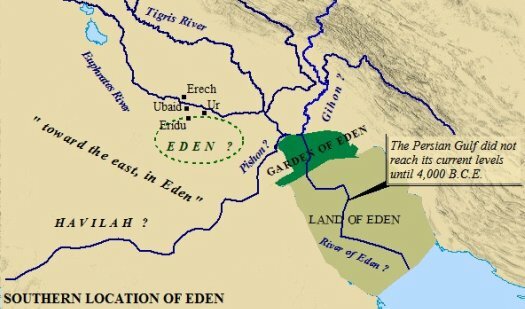 This map shows the southern theory regarding the location of the Garden of Eden. Others believe it lie north, in Turkey. Still many others claim other theories of their own. 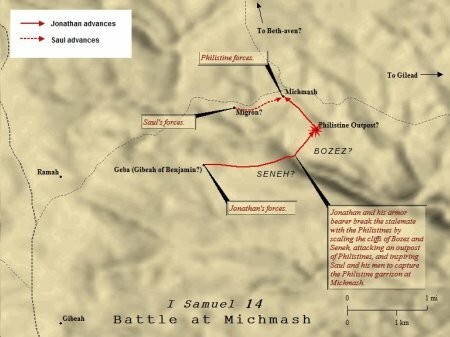 One of the most famous battles in Old Testament history, the Battle of Michmash was a glorious victory for Israel. 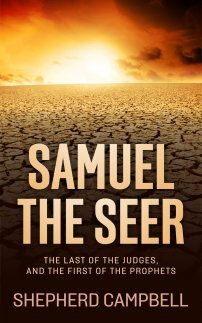 Sparked by Jonathan, Israel under King Saul served the Philistines a major defeat. Biblical history starts in Genesis, the book of beginnings, and traces God's people into the world of the Bronze Age. The first character who moves in a world well-known to history would be Abraham. Abraham is believed to have dwelt ca. 2000 BC. The Bible records him first living in Ur, in southern Mesopotamia. 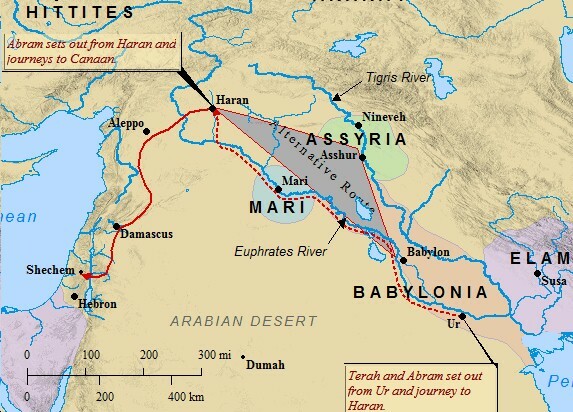 Abraham's journey from Ur to Canaan covered approximately 1,000 miles. He left his homeland following God's call. His likely route would've followed the Euphrates River. As a reward of his faith Abraham became the father of many nations. 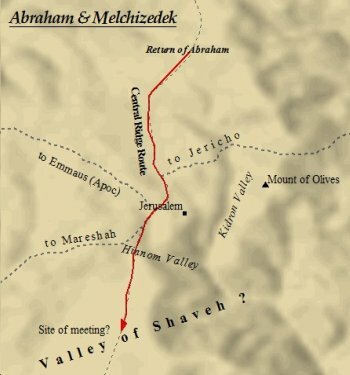 Abraham & Melchizedek met outside of Salem - nearly 1,000 years later it would be known as Jerusalem, the city of David. Melchizedek's identity remains a mystery, and a subject of many theories. 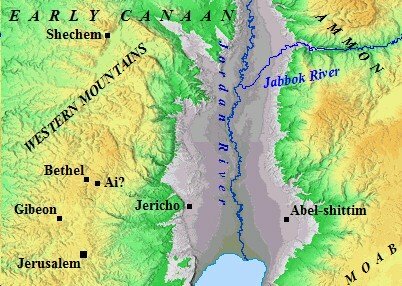 The Land of Canaan at the time of Abraham was populated with Canaanites. These people were descendants of Canaan, the son of Ham - one of the sons of Noah. Canaan was caught in the middle of the power struggle between Egypt and Mesopotamia. ABRAHAM IN PHILISTIA As he had done in Egypt, Abraham told Abimelech Sarah was his sister. The king took her only to be rebuked by God. Maps help one understand what the Bible is talking about. The ability to picture where an event took place helps to form a connection with the stories being told. These Bible study tools are invaluable. When one realizes the events and people of the Old Testament lived in a very small area, and that area is still a part of that tradition today, it brings to life the Word of God. It appears to me that since the Babylon of old is called a daughter. The one in Revelation is called the mother that the spiritual essence has relocated.